Anosmia is a medical term for a lack of functioning olfaction. The person suffering from anosmia loses ability to perceive odors. The loss can be temporary or permanent. Depending on that patients can be cured or they lose the ability to perceive odors for good which makes them susceptible to certain complications such as food poisoning. 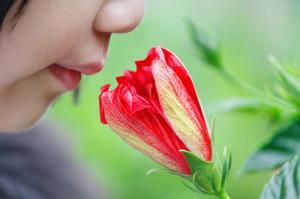 There is a variety of medical conditions that cause loss of smell. The problem generally occurs during infection of the upper respiratory tract of any kind. For example, patients suffering from a common cold, flu, sinusitis etc. commonly complain about anosmia. Furthermore, the problem affects people suffering from allergies. Loss of smell may also be associated with nasal polyps or can develop due to the growth of other nasal tumors (both benign or malignant). Exposure to certain chemicals or environmental pollutants is another cause of temporary or permanent anosmia. Loss of smell is typical for older people. The process of aging contributes to a gradual loss of smell. In some cases anosmia occurs due to nutritional deficiencies, is a side effect of certain medications or develops as a consequence of trauma to the head or neurological disorders. Treatment for loss of smell depend on the underlying cause. The sooner the cause is identified the sooner the patient can start with treatment and the results are better. Loss of smell caused by infections of the upper respiratory tract gets back to normal once the infection subsides. Patients with such infections are treated with antibiotics, nasal decongestants and symptomatic treatment. Loss of smell is prominent only in initial stages of the infection and gradually turns back to normal. In case loss of smell develops as the consequence of allergies it can be brought under control with anti-allergic medications (antihistamines, decongestants, vaporizers, steroid nasal sprays etc). They reduce inflammation of the mucous membrane of the nasal cavity and restore the smell. If one is exposed to certain chemicals or environmental pollutants there is a chance of anosmia. The problem can be easily solved if one avoids particular chemical or pollutant. Such problems tend to affect people who are smokers or those who are exposed to second hand smoke. By quitting smoking or avoiding cigarette smoke the problem can be perfectly dealt with. Anosmia associated with nasal polyps is treated surgically and the problem withdraws once the tumors are resected. In case anosmia develops as a side effect of certain medications they should be replaced with suitable substitute. And finally, in case of neurological disorders such as Alzheimer disease or brain tumors that destroy the smell centers in the brain the problem may be permanent and there may be no treatment options for restoring lost sense of smell.